The picture shows DAN 400H at Brighton during the 16th British Coach Rally in 1970. In the Pennine IV, the raucous Perkins 6.354 engine of 5.8 litres was fitted vertically, low down, at the front of the chassis, which had a high flat frame throughout its length. The earlier machines had the naturally aspirated version of the 6.354 which developed 120 bhp at 2800 rpm, and drove through a five speed, direct top, Eaton synchromesh gearbox and an Eaton two speed rear axle. HMF 600K had the turbocharged T6.534 giving 145 bhp (later 155 bhp) at 2800 rpm coupled with an overdrive top five speed box, and this vehicle was tested by the Commercial Motor journal in September 1971. A comment was made about the stiff and and highly sensitive steering that required perpetual correction to keep the machine in a straight line, and this resounded with my own experiences of the Pennine IV. 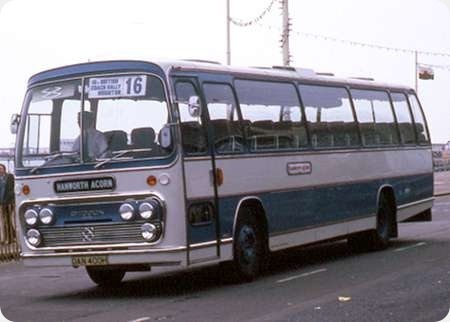 I took one of these, albeit with Pennine bus bodywork, from Gomshall to Loughborough, and I unhesitatingly declare that it was the most horrible psv that I have ever driven in my life (though the Cummins engined Leyland Lynx runs it a close second). The racket from the engine was truly deafening, and the decidedly erratic steering characteristics were exactly as described by the CM tester. Like all vehicles with the gearbox mounted behind a front mounted engine, the gear selector was awkward to use, and the brakes and suspension seemed in keeping with the generally primitive character of the entire design. Even contemplating the handling characteristics of the Pennine IV when fitted with heavy coach bodywork makes my blood run cold. What this chassis was like when equipped with the optional 8.36 litre 170 bhp Perkins V8.510 doesn’t bear thinking about. Hanworth Acorn suffered cash flow problems and ceased trading early in 1975. One wonders if the standard of “sophistication” offered by the Seddon Pennine contributed to this ignominious outcome. Interesting views. I am enjoying driving mine which is fitted with a Perkins V8 540.I will give you the steering is a little twitchy but the gearbox is a delight and when cruising the V8 "noise" I find not overloud. Maybe it has been "sorted" after 45 years and certainly the 6.354 engine had a noisy reputation whereas the V8 burbles. Mine is fitted with Girling air over hydraulic brakes system and they are really sharp. The usual wisdom is that the Pennine IV had the naturally aspirated 6.354 or the V8, and only the Pennine 6 had the T6.354. HMF 600K is described in the September 1971 Commercial Motor road test variously as Pennine VI and Pennine Six, and the test coincides with the announcement of that new model in another part of the same issue. However, BLOTW has it as a Pennine 4 (sic), so perhaps the truth is that it was built as a Pennine IV to a development spec which became the Pennine 6. The Pennine VI is a very different animal to the Pennine IV. The Pennine VI was designed as a 12M chassis using the T6354 as the V8 was too heavy for the front axle. The Pennine VI used a totally different braking system too. I own probably the sole surviving Pennine VIs. Did my time on them and the VI was an excellent machine which certainly served us well. The Pennine IV had air hydraulic brakes, whereas the Pennine 6 was equipped with a full air system. Though fundamentally very similar, the Pennine 6 chassis ended just behind the rear axle while that of the IV continued beyond to give rear support to the bodywork. Also the 6 had tubular chassis cross members instead of the channel section variety used in the IV. I note that the two present day owners of Pennine coaches are well satisfied with their machines. All I can say is that, when, with a splitting headache, I handed over that Pennine IV at Loughborough, I took a Bedford YRQ back to Surrey, and the difference was profound, like exchanging a Massey Ferguson tractor for a Rolls Royce. I had driven YRQs many times before, and admit to having had a bit of a patronising attitude towards Bedfords in general, but that visit to Loughborough imbued in me a new respect for the marque. Yes, General Motors had far greater resources than Seddon, whose products were basically an assemblage of proprietary parts, but at least it got the thing right. Mercifully, I never drove another Seddon. Roger, Think if I drove my Seddon every day I might share your opinion! The comments above are very interesting. However, some of the information is quite wrong! Well, Mr Anon, by all means put things right. We, on OBP, are entirely happy to have our errors or misapprehensions addressed. None of us on here are sensitive plants fearful of different views. That’s what makes this site the lively forum that it is. The Pennine 6 was fitted with Centrax Stopmaster brakes as later fitted to Volvo F6 trucks and later on the Bedford YNV in beefed up form. 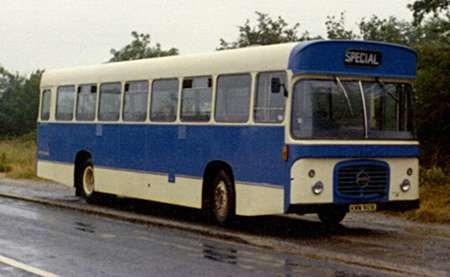 The Pennine IV had full air Girling brakes as fitted to Bedfords YRT rather than a air over hydraulic system. The Pennine 6 also featured spring parking brakes. The Pennine 6 also featured a very early use of intercooling too. Just checked my workshop manual and parts books and yes the Pennine IV was on full air Girling brakes with the lever parking brake. We ran about 10 Pennine 6s between 1975 and 1989 and would agree that when putting drivers in them for the first few days they hated them, but after that we found that they took to them and generally thought well of them. Thanks for your first hand corrections and experiences of these machines, Russell. 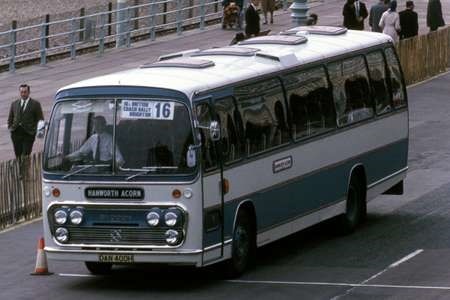 I sincerely trust that your Plaxton bodied coaches were significantly better soundproofed than the Pennine bodied bus that I drove. That thing required the driver to wear industrial specification earmuffs. I have never driven anything else so noisy. The steering was also a very suspect feature of the Pennine IV, hopelessly over sensitive. The front axle wasn’t really up to the job and we converted a couple to Bedford YRT Front axles which helped the twitchy steering, however the primary reason for the axle change was because the axle beam used to wear allowing the pins to move in the beam which would give you the steering you describe. 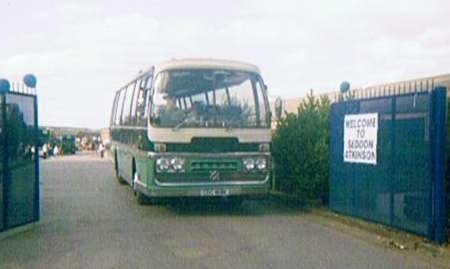 we only had a Later Pennine IV V8 Plaxton on Demo and sent it back as it was found for our operation to be not as suitable as the Pennine 6 which we already knew well. Incidentally one of ours was the last Hanworth Acorn coach SMH100M. Incidentally the photo is taken at the gate to the old Seddon Works at Royton at the last factory open day before closure. The chassis was assembled in the building partially visible through the gate. CDC with its 2 speed Eaton axle is a super drive and will fly and return 17-18 mpg. Here is a picture of the Seddon I drove up to Loughborough, Pennine IV KWW 901K, with Pennine B56F bodywork. I can’t find the negative, so I have had to scan the print. It was previously owned by the firm of Morris of Bromyard, and a picture of it may be seen on this site:- www.flickr.com/photos/nebp2/ Tillingbourne (understandably) only used it in service for a month before selling it on to Yeates in September 1977. I believe that, in order to save weight, these Seddon bus bodies did not have a full body underframe, and were attached directly to the chassis. The Perkins 6.354 was ever a raucous beast, but these Pennine bodies certainly seemed to act as effective amplifying chambers, a view confirmed by passenger trips on the Provincial examples. I have certainly never driven anything else so noisy, especially at motorway speeds. KWW was of course new to Wigmores at Dinnington and nearly made it into preservation! It lasted a good long old time in West Wales and suvived until the mid 90s! This followed on from a line of Willowbrook bodied VALs Wigmores had. Whilst i would agree the pennine IV was a fairly crude piece of equipment by UK standards Seddon couldn’t build enough of them for their export markets where the Pennine IV with its simplicity would have been its main point. Bermuda, Phillipines, Cyprus Australia all took the Pennine IV . There was a Pennine V too , there only being one in the UK , the rest of which there were a good number built were all exported. That was a rear engined monster. Your comparison with a Bedford YRQ was interesting as i would think that there were more Pennine IVs built than YRQ Bedfords. The YRQ was a very Competent machine upon which many rural operators relied on. We were a mainly Bedford Fleet with the Seddons thrown in the mix too and a couple of Leylands too. A Mk 1 National and a Tiger bought new. Here is another shot of DAN 400H taken at the 1970 British Coach Rally.